This St. Patrick’s Day table post is courtesy of our contributor Dawn from Not Just A Mommy…Hello everyone! 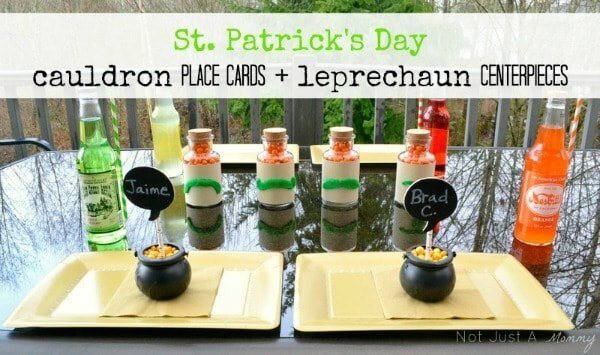 If you are looking for a little fun for a St. Patrick’s Day play date or just something special with the kids at home, I have a few fun ideas with my easy-to-make cauldron place cards and leprechaun bottles. All you will need for the place cards are unfinished wood plaques, (I found my speech bubbles at Michael’s for .29 each), add a coat of black paint, then write on them with a paint marker. If you want to reuse them, you can use chalkboard paint instead. Hot-glue them to a paper straw like these birch ones from Garnish, then stick them inside a small plastic cauldron filled with SweetWorks gold Sixlets and Pearls or your favorite round candy. As for the centerpieces? I found these great bottles at Target for only a dollar each. If you have your own straight-sided bottles, even better. Embellish with scrapbook paper and silly green mustaches (I found mine at Dollar Tree, but they can be easily found at any party store), and add more details if you want, like googly eyes. 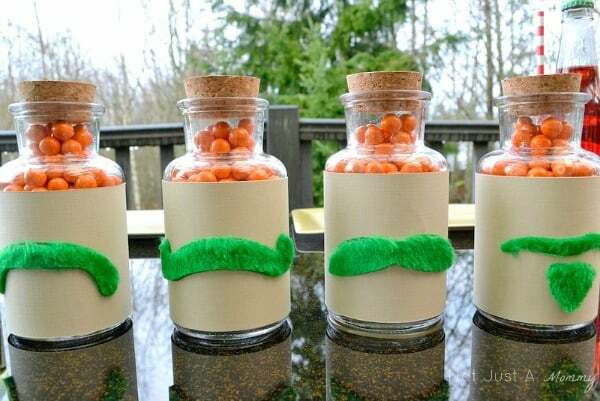 Top off with your favorite orange candy, I used orange Sixlets, and voila, little leprechaun bottles! 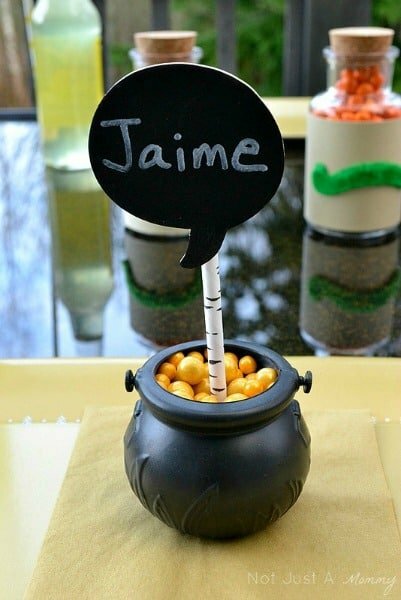 I guarantee they will get a giggle or two…and who can resist a cauldron full of candy? Like what you just read? Ya, me too! There’s more where that came from…follow Not Just A Mommy on Facebook, Twitter, Pinterest and Instagram for even more creative ideas. Never miss a post by signing up by email. You can also follow the blog with Feedly. 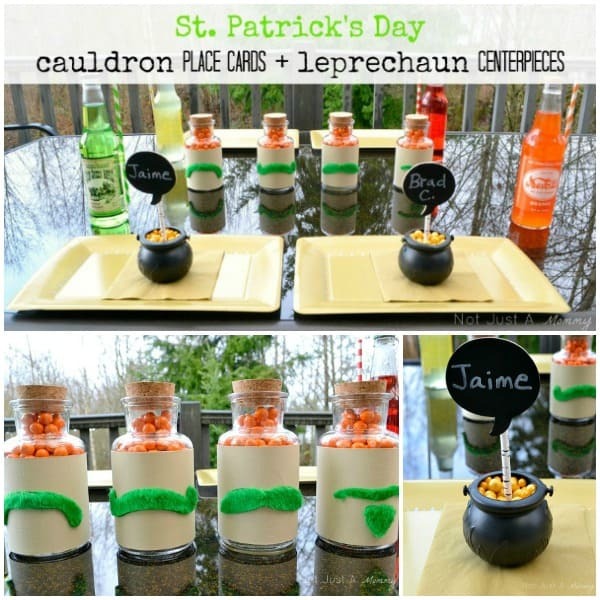 Looking for more creative ideas from Dawn for St. Patrick’s Day? 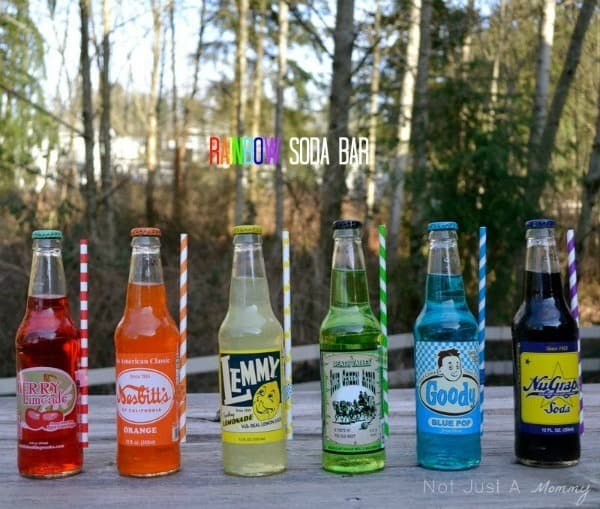 Check out this Rainbow Soda Bar idea!